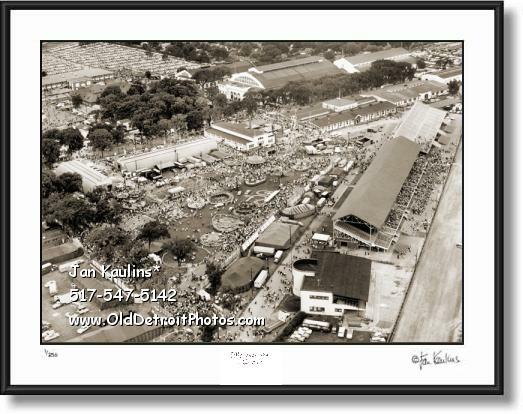 MICHIGAN STATE FAIRGROUNDS Detroit photo picture print photograph for sale. This sepia toned vintage MICHIGAN STATE FAIRGROUNDS aerial photograph print photo for sale of The Michigan State Fairgrounds in Detroit is made from a restored historic vintage Detroit black and white photo print. Aerial photos of The Michigan State Fairgrounds are quite uncommon and this is an excellent one showing the entire fairgrounds with it's carnival rides, exhibition buildings and the edge of the historic race track, home of the famous 'demolition derby' and many other fun family events. This landmark event, after running it's course for well over 150 years, is no longer happening. This is a wonderful rare aerial Michigan State Fairgrounds photo of this event from about 1960.